Read an excerpt below and the entire post in the AMA Playbook – The American Management Association’s “source for practical work solutions.” And do follow me on Twitter. I post good stuff. Promise. Know your purpose – You may want to spread a message to a larger audience, learn from thought leaders in your field, attract clients, or look for a new job opportunity. When you know your purpose, you will be more focused on what actions to take. 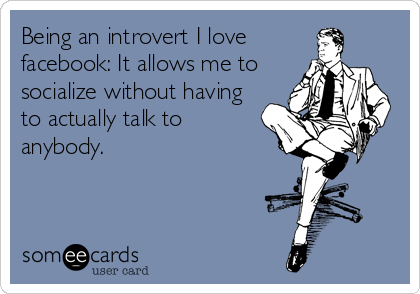 Grab a friend– Introverts are comfortable with one-on-one conversations, so why not enroll a knowledgeable social media buddy? Buy them a cup of coffee and ask them to walk you through the steps of becoming more engaged on one social media platform (e.g., getting Twitter followers or engaging in a group on LinkedIn). This is the best way to ramp up your learning curve. Be a giver, not just a taker – Like in face-to-face networking, reciprocity is valued and people who are just “takers” quickly wear out their welcome in social media. What can you offer to your online community? Share the high quality content of influencers in addition to spreading your own point of view. Leadership consultant Jesse Lynn Stoner started blogging only a few short years ago and now has over 48,500 followers on Twitter. She did this by sharing both her quality blog posts and those of other leadership gurus. Consider commenting on people’s blogs and responding to their posts. Keep at it –Like January at the gym, many people sign up for these sites and let their involvement slip. If you stick with it and commit to even 10 minutes a day on social media, you will find your rhythm and learn how to be efficient. Most importantly, you will increase your network, discover that your world expands, and making and cultivating new relationships will be reinforcing. Talking is allowed – Finally, follow up with relevant contacts you have met online and schedule meetings with new people on the phone and face-to-face. After getting to know people virtually, you will have information about them and their interests that will jumpstart the conversation, and your interactions can take a deeper dive. This entry was posted in Uncategorized on March 12, 2015 by Jennifer Kahnweiler. This thoughtful process offers to improve the leadership potential of many who make a significant contribution to the people around them, and, by extension, our society at large.